Last weekend, I turned our kitchen table into a dry erase board. I purchased an 8’ x 4’ sheet of white shower board and a roll of foam carpet tape from my local big box hardware store. I cut the board to fit the size of our kitchen table, attached strips of foam to stop it from sliding, and set it on the table. It was simple and inexpensive. It’s also incredibly useful and a lot of fun. The entire family loves it! 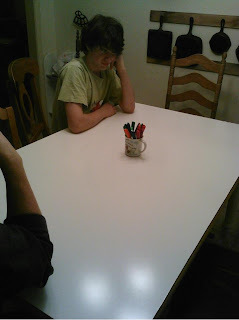 A coffee mug full of dry erase markers now sits in the center of our table. It has released the inner doodler in all of us. We’ve had Monopoly Boards, Master Swords, Tic-Tac-Toe boards, personal portraits, smiley faces, mazes, and a variety of other games drawn and played on the table. The best part is, they disappear with a simple wipe of a cloth! Yesterday, we were able to complete Math, Language Arts, and Spelling examples on the table in front of us as we sat together and worked through the day’s lessons. It gives our lessons a casual feel that my children and I enjoy. This table top board is easily removed if we want to set the table for a meal. We can eat on top of it if we choose, or we can cover it with a table cloth for more formal occasions. The best part is, the total cost was only $20. This was a simple innovation that will last for years. I should have done it sooner! Why, thank you! You should get one of your own. Cool table. And good to hear from you again! Fantastic idea!! My kids are always using the one on the wall. You're such a smartie!